deSIGNery Sign Company is a dedicated business to both its customers and products. We supply only the highest quality vinyl decals and transparent stickers to our customers with competitive pricing. Custom vinyl stickers give you the chance to create anything to express appreciation, support, and interests. The easy removable capabilities that our vinyl decals posses, offers you a stress free experience to save you headaches and clean up time. Our stickers are screen printed with UV inks which makes it possible to place your custom vinyl stickers just about anywhere. Check out our Spring Sale for savings on Custom Printed Decals & Labels and Custom Square-Cut Stickers in the following link. BBB Member since 2004 with a proven record of complaint free customer satisfaction on items like Custom Printed Decals & Labels. Click on the BBB logo above to check our record or leave a customer review. If you are in the market for Custom Square-Cut Stickers, give us a call today and you will soon realize why after 24 years we still have an A+ BBB rating! At deSIGNerySigns.com we have more than 24 years experience in designs for our Custom Square-Cut Stickers. Call us today and let our design specialists help create your next project to promote your product or business. 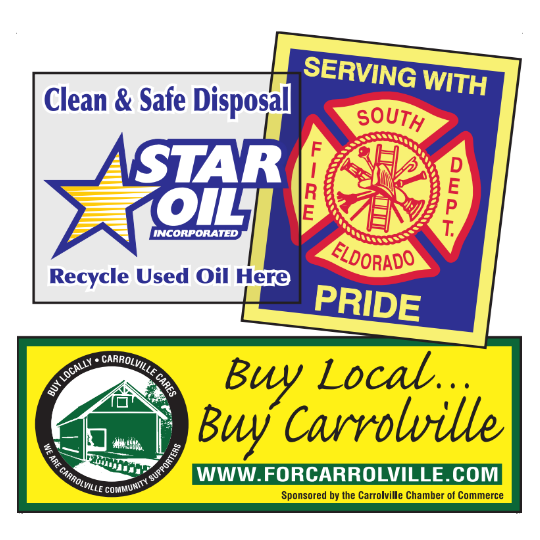 FREE Shipping on all decal and sticker products | Free layout | A+ BBB rating | 24 years in the business | Call Today for a free quote on Custom Square-Cut Stickers. Custom Clear Stickers are normally supplied with permanent, pressure-sensitive acrylic adhesive. Temporary adhesive is available at no additional charge. Please specify. For face adhesive decals, transparent polyester must be used. Decals are furnished with split backing for easy application. Custom white vinyl stickers and personalized yellow vinyl decals and stickers have become a very popular item over the years. deSIGNery’s best value vinyl decals deliver you just that, the best value. The best value stickers are chosen from our most popular size stickers that are most commonly ordered. Sometimes there is a reason for a specific size, but more often than not, a common popular size will do just the trick. Vinyl is a very durable material that can handle most weather conditions, sun and dirt. Our stickers are printed using UV inks which helps it to not fade. This way your custom vinyl decal will look great even a few years after you had applied it. The adhesive that is used on our screen printed vinyl stickers is quick and easy to remove with little to no clean up of sticky residue. Our screen printed best value stickers are also available in a yellow vinyl. Yellow is a bright color that everyone is aware that it means caution. Yellow vinyl stickers can be used as parking passes, security identifiers, club member passes, and you name it! They are also great to be used as labels on machines with moving parts to warn workers and visitors. You can also use the yellow vinyl as a convenient material if the background color is yellow. They are also available to be numbered for a small additional cost. Order Free Samples of Custom Stickers Today!